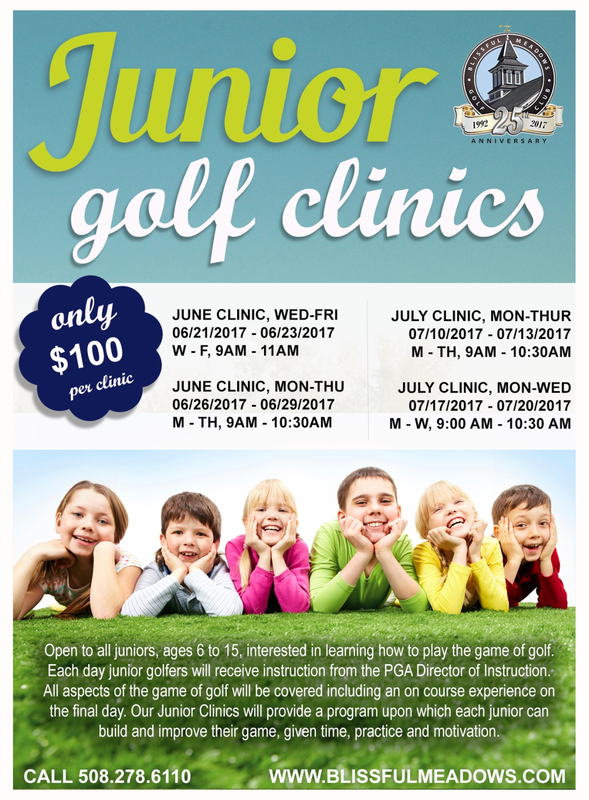 Blissful Meadow's Junior Clinics are open to all juniors, ages 6 to 15, interested in learning how to play the game of golf. Our clinics are run by our Director of Instruction, Joe Griffin. Joe began his PGA career at Blissful Meadows in 1994, and is a PGA class "A' member and graduate of the PGA Professional Golf Management Program. Our Junior Clinics will provide a program upon which each junior can build and improve their game, given time, practice and motivation. Contact Joe Griffin, PGA Professional, or call 508.278.6110 for additional information. Blissful Meadow's Junior Clinics are open to all juniors, ages 6 to 15, interested in learning how to play the game of golf. All aspects of the game of golf will be covered including an on course experience the final day. Our Junior Clinics will provide a program upon which each junior can build and improve their game, given time, practice and motivation.